Kroger is on a ROLL with all the FREEBIES that we have seen lately. 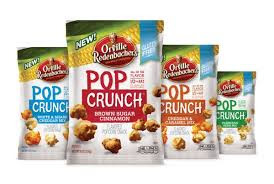 Today, you can download a Kroger Digital coupon for a FREE bag of Orville Redenbacher's Pop Crunch. Please note that today, July 5th is the ONLY day that you can download this FREEBIE. But, you'll have until July 20th to use it at Kroger.